The Ion Age Blog: Prang Army 15mm packs now released at The Ion Age! 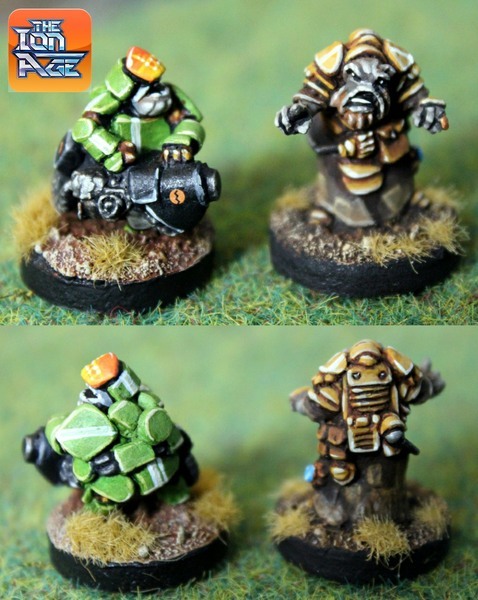 Prang Army 15mm packs now released at The Ion Age! 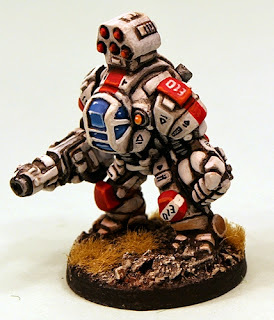 Back in January 2016 we at The Ion Age welcomed the Prang to the 15mm range of miniatures. Since the release of the Prang Raiders their creator Eli Arndt has been hard at work sculpting the follow up for these hulking aliens...the Prang Army. Now is the time and it gives me great delight to announce the release of the first two packs in the regular Prang Army. Go HERE to see the range or read on for more information. All of our miniature releases for the month! Later this month we will be publishing a free PDF article for Patrol Angis giving an introduction to as well as game statistics for the Prang Army in play. We are working on that right now and it will be a great resource. The Prang Army is much better organised and equipped than the Raiders and it is against the Raider that they are presently fighting though they have agreed to a treaty with the Prydian Army to take the war to the Shia Khan Empire too. The core fire team for your alien Prang Army. 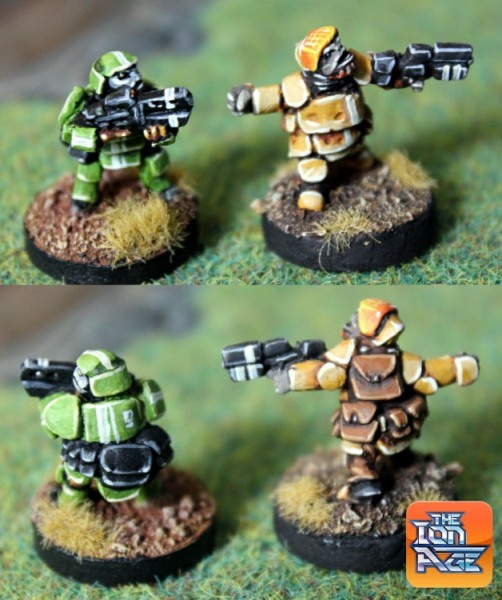 These miniatures are typical troopers with a variety of poses all with Blaster Rifles. This code contains five different white metal 15mm scale poses all wearing ceramic armour. From left to right these are Prang Trooper with servo assist Blaster Rifle, Prang Sergeant with Blaster Rifle arm raised, Prang Trooper with Blaster Rifle advancing, Prang Trooper aiming Blaster Rifle and lastly Prang Trooper firing Blaster Rifle. These detailed miniatures are the height of a Human (around 17mm though they do go up to 20mm for the bigger Prang) but are much bulkier. Go HERE. This code can be bought as a pack or as single miniatures or three packs saving 10% off list. Chose your option from the drop down menu on the page. Price per pack is 5.00GBP. The heavier weapon fire team for your alien Prang Army. These miniatures are typical troopers with a variety of weapons. This code contains five different white metal 15mm scale poses all wearing ceramic armour. From left to right these are Prang Sergeant with Blaster Rifle pointing, Prang Trooper with Arc Cannon and visor, Prang Trooper with Blaster Focus Cannon, Prang Trooper with Heavy Auto Cannon and lastly Prang Trooper with Sonic Stunner firing from the hip. These detailed miniatures are the height of a Human (around 17mm though they do go up to 20mm for the bigger Prang) but are much bulkier. Go HERE. This code can be bought as a pack or as single miniatures or three packs saving 10% off list. Chose your option from the drop down menu on the page. Price per pack is 5.00GBP. To see all of the Prang go to the website HERE. Above are two comparison pictures showing the new Prang Army next to the existing Prang Raiders. There are many thousands of Prang miniatures out across the world and we hope that you can now see how these brand new soldiers compare to those in your existing collection. Such fine detail and compatible nature to the Prang Raiders but different armour and equipment. Excellent! What other Prang do we have? Why the original Raiders of course. As already stated the new Army is facing off against the mercenary meanies already in Prydian Space harassing Humans and nicking their possessions if not their very selves. There are several packs including a value platoon of all fourteen poses with a small discount. It is our intention to continue to expand the Prang Army with your assistance and custom into an entire force consisting of a core platoon with character packs plus larger items as well and even vehicles. It begins here though with September's two new packs. Say hello to Ambassador Throag of the Prang who is the thirty seventh free monthly miniature. A 15mm alien character which is free in every order every time all month before being retired. This miniature is automatically put into every order at the rate of one per order regardless of order value. It can also be bought in any amount on the monthly IMP page of the website for this month only too before being withdrawn on the first of next month. We are into Year Four now and if you missed it you can see the Year Three Collection on the website. IMP37 Prang Ambassador is a fantastic character in its own right for any science fiction setting but his real place is alongside Prydian forces or Prang Army fighting against Prang Raiders or the Shia Khan Empire. This miniature is in one piece and stands approx 20mm tall and is armed with a Tumbler SMG. We have now released all of our miniatures for the month but we have more releases to come in the shape of two new posters and we have a free PDF for the Prang Army in Patrol Angis coming soon too. Lastly there will be a full article on this but our special offer for this month lasting until months end is the IAF020 Havelock Battlesuit one of our most popular original codes which is now in resin rather than metal and now comes with ALL the weapon variants on a sprue at the same price meaning more value plus it is 25% off. Really pleased to see these and even more pleased that there will be a PDF to go with them. Thanks Andrew. They are lovely and Eli is finalising the fiction just now. Later this month for the free PDF. My Prang and Havelock suits arrived safe and sound today. Many thanks. Really nice miniatures and bigger pieces such as the Havelock are even better now they are in resin. Thanks Andrew for letting us know. We did a degree of re-master on the Havelock when putting into resin molds and we are glad you like it. Enjoy!